It's a statement she'll always hold close to her heart-lovely lilies and radiant roses that speak to your love and devotion. 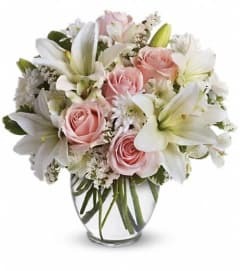 Arranged lovingly into a pink glass vase, this is a bouquet that brightens any day. 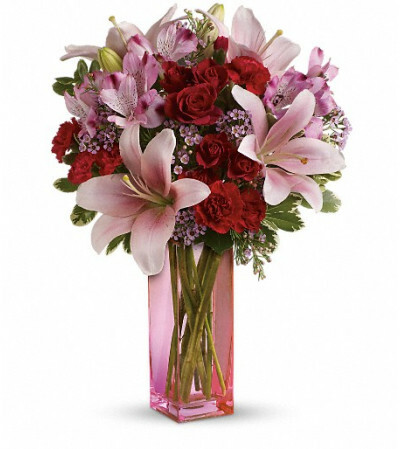 Includes red roses, pink asiatic lilies, pink alstroemeria, miniature red carnations, pink waxflower and lush pittosporum. 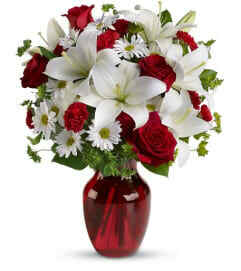 Delivered in a Bunch vase.